In the tidy, well-lit space, there’s the obligatory row of Kraft Dinner. Shelves hold an array of jello, cans of spaghetti-Os and Gatorade. The small room tucked away on the top floor of Nova Scotia Community College’s Waterfront Campus houses the student food bank: a potential lifeline for students struggling to put themselves through school. For many students, balancing the cost of groceries, school supplies, household necessities and sometimes even child care becomes a drain on student loans and part-time paycheques. 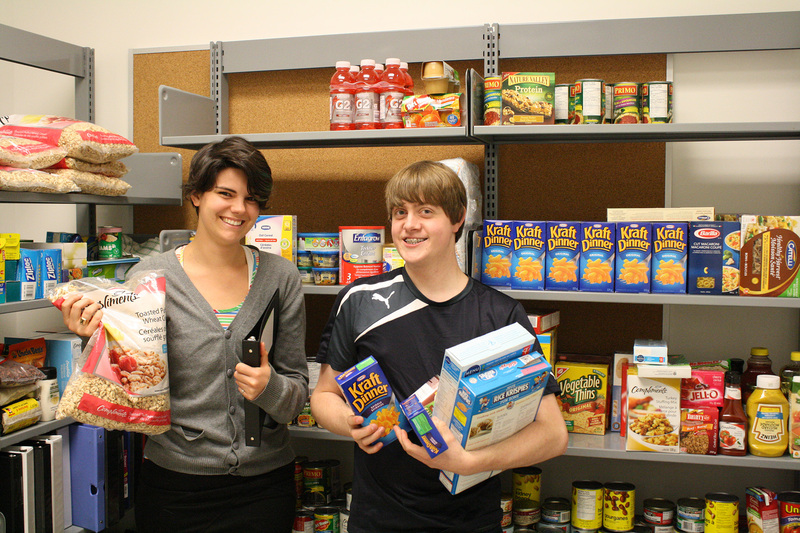 While loans are limited by student and parent income, the food bank program is available to any student on campus. Lori Foran, the college’s student life coordinator, says the food bank has existed since Waterfront Campus opened in 2007, and was developed through the combined efforts of administration and student associations. Bridget Campbell is vice president of services at Waterfront Campus. The food bank falls under her jurisdiction. Campbell says donations to the food bank are generous. At a barbeque in early October, students received a burger and a drink in exchange for a donation. About 100 pounds of food was collected. Ryan Pilmer, vice president of activities, has also worked with the program. He says the campus’s business school holds food drives, and the cafeteria donates loaves of bread each week. Though edible items are most common, Campbell says the food bank also receives non-food donations cash-strapped students might need. Kitchen and household necessities such as tinfoil, plastic wrap and Ziploc bags are neatly stacked alongside pet food, diapers and baby formula. Next to binders and looseleaf, four shelves are stuffed with donated textbooks. Campbell says students are welcome to visit the food bank twice a month. They can take one or two bags of supplies each time, depending on the size of their household. Since the beginning of the school year, about 20 students at Waterfront Campus have used the service. The program coordinators have devised creative ways to encourage donations. For instance, Campbell says, during “PB and J Month” any student who donates a jar of peanut butter or jam is entered to win a prize, such as one month of free campus parking. On Halloween, costumed students went door to door seeking donations for the Trick or Eat campaign. Foran says the student association also contributes more than $3000 each year in the form of food, gift cards for perishable items and hampers during the holiday season. Campbell intends to expand the program. She encourages donations of personal hygiene items such as deodorant and shampoo. She also plans to host clothing swaps. The food bank’s secluded location, away from the stream of class-bound scholars, helps prevent a stigma around visitors. But Campbell does not think students feel shame using the food bank.